Cardinal Jean-Louis Tauran, President of the Pontifical Council for Inter-religious Dialogue, was born on 5 April 1943 in Bordeaux, France. He was ordained a priest on 20 September 1969. He holds licentiates in philosophy and theology and a degree in canon law. Following ordination, he served as parochial vicar in Bordeaux. Created and proclaimed Cardinal by the Bl. John Paul II in the Consistory of 21 October 2003, of the Deaconry of S. Apollinare alle Terme Neroniane-Alessandrine (St. Apollonius at the Neronian-Alexandrian Baths). 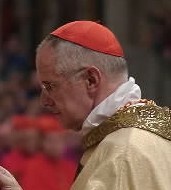 Proto-deacon as of 21 February 2011. Special Council for the Middle East of the General Secretariat of the Synod of Bishops.